For Afghanistan, the Kabul River is far more than a tool of coercive diplomacy against Pakistan. From the Mayan Empire to modern-day Syria and Yemen, water insecurity has been a predominant cause of social distress, conflict, and crisis. Studies show that there is a 75 to 95 percent probability of water wars in the next 50 to 100 years as the effects of climate change spur intense competition for increasingly scarce resources. The Kabul River is already fueling a “wicked” conflict between Afghanistan and Pakistan, aggravating a conflagratory relationship between the two South Asian neighbors. Afghanistan has abundant water resources. It produces 80 billion cubic meters of water a year, pumping 60 billion cubic meters of it to the neighbors — particularly Pakistan. The Kabul River supplies 26 percent of the annual flow of water in the country, rising in the Hindu Kush and flowing along the borders of 11 provinces before draining into the Indus River near the city of Attock in Pakistan. The river and its tributaries provide an important source of livelihood for nearly 25 million people living around the basin – and that population is expected to increase to 37 million by 2050. The Afghan government recently announced that they will soon commence work on the construction of the $236 million Shahtoot Dam on the Kabul River. The dam is expected to hold 146 million cubic meters of potable water for 2 million Kabul residents and irrigate 4,000 hectares of land in the Charasiab district of the province. The project is a component of Afghanistan’s India-backed ambitious plans of building 12 dams on the Kabul River basin. The project, however, has agitated the water-stressed Pakistan. In a conference recently held in Peshawar, the Pakistani officials showed deep concerns regarding the inauspicious effects of the project on the agricultural production and livelihood of Peshawar residents. Pakistani media have even framed the project as Afghanistan’s oppressive policy toward Pakistan, masterminded by India. But for Afghanistan, improving its power and water infrastructures is imperative to jumpstart its lagging economy and ensure internal stability. Decades of war have destroyed most of Afghanistan’s water infrastructure and impeded the construction of modern water storage facilities, leaving 80 percent of the country’s rural population without adequate access to drinking water. Only 5 percent of its population nationwide and 1 percent in rural areas have access to improved sanitation. And a recent 60 percent decline in rain and snowfall has furthered the water scarcity, resulting in one of the worst droughts in recent decades. That has left 3.6 million Afghans in desperate need of food and has displaced 260,000 people internally — more than the number of people displaced in the war with the Taliban. Furthermore, Afghanistan’s stagnating economy has seen the poverty and unemployment rates rise exponentially, reaching 55 percent and 40 percent respectively. As foreign aid is diminishing, the Afghan government sees agriculture and its vast mineral deposits as long-term prospects for revitalizing a slumped economy. Agriculture is considered as the backbone of the Afghan economy. More than 80 percent of the Afghan population lives in rural areas, the majority of whom depend on agriculture for livelihood. The sector employs 40 percent of the national workforce offering a great potential for creating more jobs, raising labor productivity, benefiting women, and reducing food insecurity and poverty in rural areas. Moreover, Afghanistan is endowed with an astonishing $1 trillion worth of untapped mineral deposits. It has 1,400 mineral fields, containing iron ore, lithium, sulfur, precious and semi-precious stones, copper, and coal, among other resources. But the development of both sectors depends on reliable and sustainable water and power. Afghanistan, despite having the potential of producing 23,000 MW of electricity from hydropower, produces merely 300 MW — 2 percent of the power generated by Pakistan. Only 28 percent of Afghan households are connected to power supply systems. The country imports 75 percent of its power from regional countries, yet the import of electricity has proven to be very costly, unreliable and unsustainable. Therefore, improving its power and water infrastructure is a pre-requisite for the socioeconomic development of Afghanistan. The Kabul River, on the other hand, is fundamental to meeting the demands for irrigation, potable water, and power in Khyber Pakhtunkhwa (KP), the northwestern region of Pakistan bordering Afghanistan. The river irrigates three districts of this fertile region – providing 85 percent of irrigation in Charsada, 80 percent in Peshawar, and 47.5 percent in Nowshera — and is the sole source of drinking water for millions of Pakistanis living around the basin. 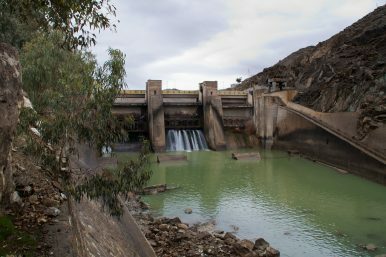 A supply gap of nearly 9,000 MW of power, meanwhile, has caused “two to 17 hours of load shedding nationwide with consumers of Sindh, Baluchistan, and Khyber Pakhtunkhwa (KP) being the most affected by the increasing electricity deficit.” The Warsak Dam, constructed in 1960 on the downstream of the Kabul River, generates 250 MW of electricity for the Peshawar Valley. It is estimated that constructing new dams on the upstream of this river can reduce water flow into the Warsak canal by 8-11 percent. Thus, restricting the flow of water can have negative spillover effects on the socioeconomic development of the KP region, thereby stirring social unrest. In the last 50 years, 150 water treaties have been signed to make international relations over water more stable and predictable. For instance, the Indus Water Treaty was signed between Pakistan and India in 1960 to regulate how the two countries share the Indus River. But the treaty did not fully resolve the water conflict between the two South Asian neighbors. In recent years, India has been using the Indus River as a retaliation against Pakistan following their mounting political tensions. In a meeting to review the treaty, Indian Prime Minister Narendra Modi said, “Blood and water can’t flow together.” Thus, India is planning to construct new dams on the river to maximize its water usage and is reviving the Tulbul project — a dam that has fueled dispute between India and Pakistan since 1987. For Afghanistan, however, the Kabul River is beyond a tool of coercive diplomacy against Pakistan. It is a mean of livelihood for 7 million Afghans living around the basin, and an indispensable resource for reinvigorating its collapsed economy. Though signing a treaty is ideal for the efficient use of the river, given the capricious political relationship between the two nations, the Afghan government will not sign an agreement with Pakistan — at least in the immediate future. Nonetheless, it is inevitable that Kabul must respect the rights of Pakistan as the lower riparian of the Kabul River. A “win-win” solution, therefore, requires Afghanistan to ensure “equitable” and “reasonable” use of the river — under the framework of the 1997 UN Convention on Non-Navigational Uses of International Watercourses — to cause no harm to Pakistan. And, in response, Pakistan should contribute to the economic development of Afghanistan, especially by opening its trade and transit routes for the Afghan businesses. Waleed Majidyar is the former Vice President of Afghanistan Investment Support Agency. He has an MBA and MPP-International Affairs from the University of Southern California. He tweets @WMajidyar. The Afghan Endgame: What, When, and HowDepoliticizing South Asia’s Water CrisisThe Taliban’s Delusion Hampers ReconciliationImran Khan’s Foreign Policy ApproachWhy Can’t Pakistan Facilitate a Long-Term Ceasefire in Afghanistan?